This high end DKN T210 motorised folding treadmill features a 1.5 continuous duty motor ensuring a smooth operation at all speeds and intensity requirements, and has a maximum user weight of 100kg. This motor can operate smoothly at speeds up to 10mph (16kp/h), and with direct speed keys on the console you can quickly and easily select your desired speed and go straight to it. No more pressing keys repeatedly to achieve your desired speed. 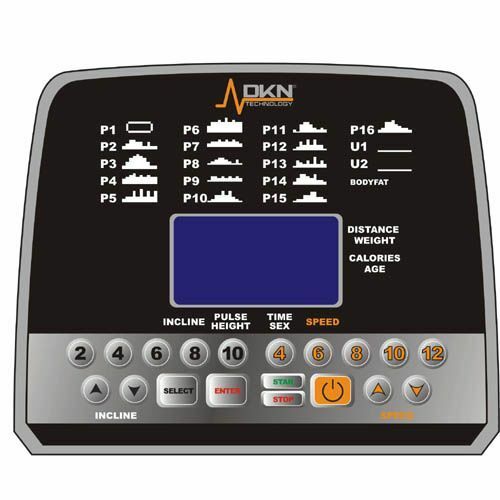 The DKN T210 treadmill also features a powered incline range of 1-10% which again is controlled directly from the quick select hot keys on the console, making this an incredibly easy to use and versatile treadmill for all users. The T210 also features the PSA (Progressive Shock Absorbing) system deck with a 125cm (49") long and 42cm (16.5") wide orthopaedic running belt. This deck cushioning actually works with you to increase the cushioning the harder you strike, to maintain optimum support levels at all times, and consistent propulsion in to your next stride. The orthopaedic belt added to the PSA cushioning means impact is reduced by up to 20% compared to running on the roads, ensuring a reduced chance of injury over time. The console on the T210 provides you with constant motivational feedback to keep you on track at all times, and the backlit screen makes it easy to read and clearly displays your data. Providing you with all the feedback you need on speed, time elapsed, theoretical calories burned as well as incline, distance covered and pulse, you can be sure to stay on track and achieve your fitness goals fast. The 'Plug and run' design of this machine means that right out of the box you merely fold the treadmill open and start training, no assembly required. 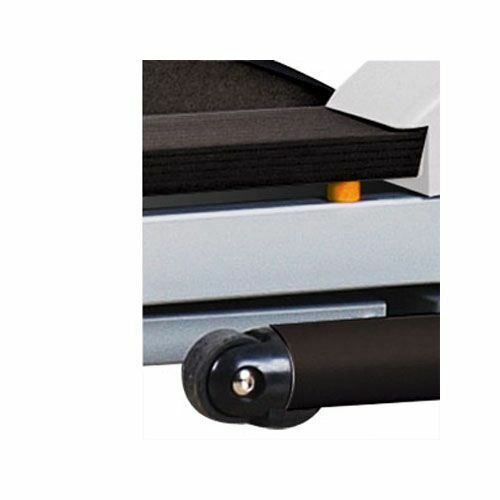 Once your workout is complete, simply use the assisted fold deck to conveniently store the deck upright, and wheel away using the integrated transport wheels. A complete workout and home gym companion that does not take up loads of space. Programmes: 18 programs including: 1 manual, 6 speed preset courses, 6 incline preset courses, 3 cross training preset courses + 2 user programs + body fat calculation. 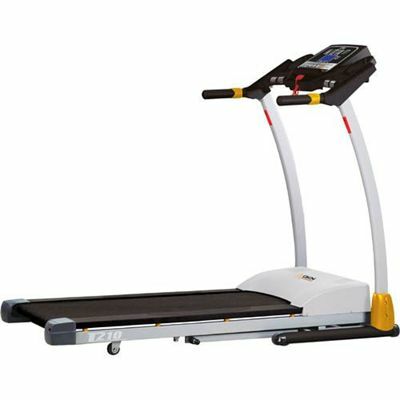 for submitting product review about DKN T210 Folding Treadmill.